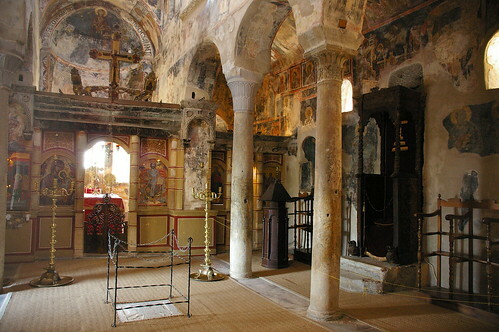 donors from frescos in Galata and Pedhoulas, Cyprus. Helena's mother died when she was five years old, an age to have established specific memories, as well as a sense of devastating loss. In their memorials for Cleofe, Nikiforas Cheilas spoke of "her most dear daughter," and Demetrios Pepagomenos, the family doctor said, "Your beloved daughter mourns you, bereaved of her dear mother at so young an age, at a time when she most needed you, and required your instruction and advice, who have left her with no maternal consolation." 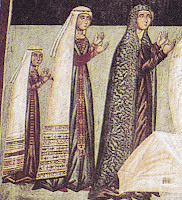 On 3 February 1442, possibly on her fourteenth birthday, and a day or so after she arrived in the country, she was married to the King of Cyprus, John II, in the cathedral of Nicosia. Look at that photograph, and then look at the cathedral of Mistra. She must have found it overwhelming, the city overwhelming, after the little churches and closed spaces of Mistra. She was from a puritan court when men and women were covered from neck to feet (and women's heads and necks covered, and she came to a court where the men wore tight-fitting hose, very short jackets which showed more than anyone needs to know about, great puffed sleeves, and wide turbans; the women, high-waisted, low-necked gowns with long trailing sleeves and upswept hair revealing great expanses neck, bosom, and back. I imagine a terrified adolescent, adamantly refusing to change her dress, almost flaunting her severely covered-up Greek style and hidden hair. John was ten years older than she, had become king at the age of fourteen, had been married before (to a distant relative, Medea Palaiologina of Montferrat), and had a very pretty mistress at court -- Marietta de Patras -- by whom he had a son. A story is told concerning Helena's treatment of Marietta's nose, either by biting it off or by having it cut off (with the intent of causing an abortion, although the infant involved was three years old at the time), but the nose sounds unlikely and is very much the sort of story that abounds in Cypriot accounts of high-born women. As does the story that she poisoned the husband of her 13-year old daughter. Really, Cleofe's daughter simply could not have done that. Further, accounts of the street brawl and illness that immediately preceded the husband's death suggest other possibilities. Nothing survives as direct evidence of Helena, there is no correspondence and no documents -- only what people reported, and the reports are almost entirely from those who fall on the Latin side of the Latin-Orthodox divide. Her foster-mother, and her son Thomas, had accompanied her to Nicosia. They are remembered as powerfully ambitious. 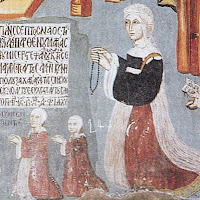 Helena is remembered in the Cypriot chronicles for imposing her Mistra Greeks on the Lusignan court, for pushing policies that favored the Orthodox, for hostility to the Latin church, and for seizing and using political power -- with the consent of her husband. They also complained that she spent money aiding refugees from Constantinople. The Cypriot chronicler, Henrico Giblet, described her as "fine & adroite" -- fine could mean "pretty," but he more likely meant "subtle, shrewd, sharp." The chronicler Estienne de Lusignan described her as "una donna astuta & sagace greca" -- "an astute and shrewd Greek lady." Of course she was, with those parents, but I think it is particularly through comparisons with her mother, Cleofe, that we begin to understand what was said about her, and understand how she had been damaged even before she arrived in Cyprus. 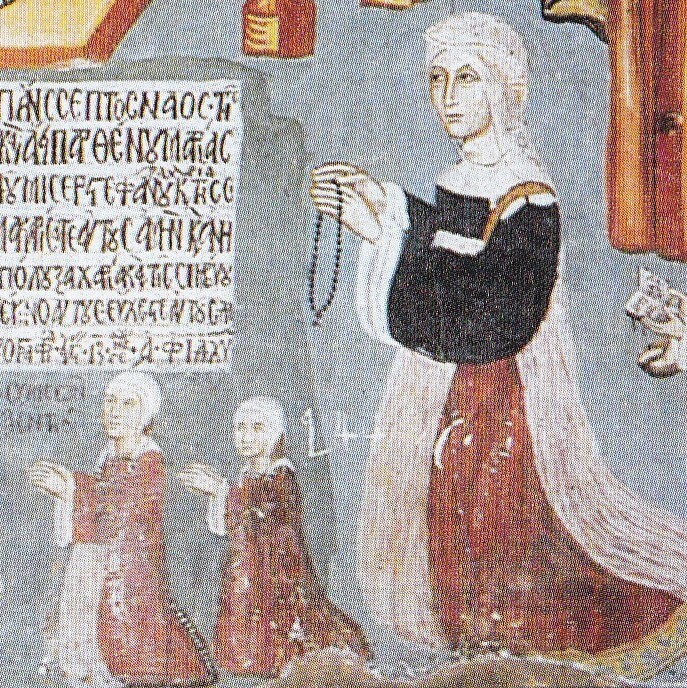 Helena was particularly reviled for her support of Orthodoxy, her generosity to a particular monastery, and her advancement of Orthodox clergy. Nothing is said about her own spiritual life, but who had there been to nurture it? Cleofe was deeply devout, but she had grown up with, and when at Mistra, corresponded continually with women who were equally devout. A small girl could translate deep devotion into militant action as an adult, particularly in what she must have felt as isolation.
. . . do you know the monk I met a few days ago? He brought me a message from my niece that she is in need of something; she would have told me in her own voice what she wanted; had it been possible, she would have sent her message through a loyal, trusted courtier, but she has none. As she does not have one and cannot make the trip, I must send a man whom I consider appropriate . . . it is you, since you have acted and made decisions for me, know me personally, and have been informed. (XXXIII. 8-9)"
". . . not enough to moisten her palate." Helena had no one whom she could trust. That is a significant comment, considering the presence of a foster-mother and brother, and it is not a rare characteristic of individuals who have been bereaved at a young age. Still, Sphrantzes does not say if he actually made the trip. Giblet, said that "she liked being queen, she also acted like a King, and in effect, governed the kingdom." Estienne de Lusignan said, "vedendo il suo marito esser huomo feminile inhabile à regger'il regno; prese lei il governo" -- "seeing her husband was weak and unable to rule his kingdom, she took over the government," and he later reports that the High Court declared Helena regent. (But her grandmother Helena had served as regent when Manuel was abroad.) One account says that John was never entirely well, but Pius II -- and later chroniclers -- wrote that John had been educated among women as a boy, that he acted more as a woman than as a man, and concerned himself with banquets and pleasure. For there was nothing that was not communicated to your judgement and thus some difficult problems were solved, while matters of greater moment, of holy governance and of the (soul’s) ascent were determined by the superiority of your virtue. . . .
. . . as she stood by her husband, the most holy despot, yielded to the men around him and enjoyed a sort of splendor and radiance while doing only what seemed right to her. . . . In the midst of turmoil, when present among the imperial councillors she gave virtuous advice of every sort, and made herself available to help everyone, from which both sides learned the better, and the better triumphed over both . .
Well, Cleofe had grown up without a mother, but with Battista's love and guidance in poise and discretion. Helena had no such guide as she moved into adolescence, but she apparently had the touchy disposition of her father Theodoros and grandfather Manuel. Pius II wrote that her foster-brother Thomas ruled in his mother's place, his mother ruled in Helena's place, and Helena ruled in place of the king -- "regina regem regebat." He was proud of his literary style. It is true that King John made Thomas Chamberlain of Cyprus. It is also true that John's son, James, eventually murdered Thomas. It was not James' only murder. James was tall, broad-shouldered, terribly good-looking, much indulged by his father. The Genoese governor of Famagusta wrote, "The king was governed by a queen . . . a detestable Greek." A chronicle published in 1788, by the Archimandrite Cipriano, says: ἀλλ´ οὖσα τῇ ἀληθεία γυνὴ μὲ φρόνημα ἀνδρικόν. καὶ πνεύματος ὀξέος, καθὸ Ρωμαία -- "though she was in truth a woman, she had a man's mind, and a quick spirit -- since she was Greek." That is what Nikeforas Cheilas had said about her mother Cleofe: "she possessed a truly masculine intelligence." The Greeks seemed to appreciate what the Latins found threatening. Beyond these remarks, all we know about her is that she was never very healthy. We have no real impression of her personality, no idea of how she and her husband regarded each other outside issues of ruling. There were two daughters: Charlotte, born in 1444, who was married at thirteen and queen at fourteen; and Cleofe who died very young, in 1448. Helena herself died 11 April 1458, at the age of thirty. One of the chronicles has her, on her deathbed, angry at the marriage John had planned for Charlotte, to a first cousin, and demanding Charlotte reject the marriage. John died the next month. The deaths are not explained. Charlotte became queen, and in the fall married the cousin. Her half-brother, James, claimed the throne, and with the aid of Egyptian troops captured Famagusta and Nicosia, driving Charlotte from Cyprus. Charlotte died in Rome in 1487 and was buried in St. Peter's. James eventually married Caterina Cornaro, who later sold Cyprus to Venice, and was painted by Gentile Bellini. Eva Latorre Broto, "Elena Paleóloga de Chipre: revisión de un mito," Erytheia 23 (2002) 159-186, in Spanish. ______, "Η Ελένη Παλαιολογίνα, αναθεώρηση ενός θρύλου," L’épopée dans le monde grec: Η εποποιια μεσα στον ελληνικο χωρα. Colloque International, Nancy, mars 2001. Ioanna Christoforaki, "Sainted Ladies and Wicked Harlots": perceptions of gender in medieval Cyprus."